About Classic Recreation Systems shade structures, shelters, gazebos and pavilions. When today’s top automobile designers build a brand new vehicle, they look to the past for inspiration and the stylistic elements that consumers loved. They blend them with today’s clean lines and high technology, which results in a “modern classic” that is better than the original. The team at Classic Recreation Systems, Inc. is committed to doing the same with shade structures. They draw on classic architectural styles and combine them with years of experience in engineering and landscape architecture. The result is the highest quality shelter in the industry, setting the standard for quick and easy construction and good looks. Years of working closely with design professionals has resulted in a wide variety of innovative solutions for virtually any recreational or outdoor use. By partnering with your team, Classic Recreation provides you with truly distinctive solutions for your design needs—just send in your sketches and we will provide the construction drawings! Government agencies, schools, and private companies alike know about Classic Recreation’s quality, and continue to specify our designs throughout the world. They appreciate a company that does the job right without compromising quality, while maintaining integrity and respect for project deadlines. Our name is our motto: “We are dedicated to providing classic shade structure designs for the recreation industry, with the most innovative construction systems available.” And you get a modern classic with years of trouble-free enjoyment. It’s not only shelters that Classic Recreation builds, it’s community too. The nice folks that cut your posts, weld your brackets, process your orders and address your concerns are well qualified to make sure you are satisfied with your dealings with us. We’ve been in the business a while now, and we’ve been growing like crazy! Must be because we’re making a lot of customers happy. A little history about Classic Recreation… Back in 1989 when Newell Roundy, President of Classic Recreation was a landscape architect in the Phoenix area, he often remarked about the lack of prefabricated steel shade shelters whose proportions, details and designs were of the quality that he wanted to use in the numerous projects he was working on. 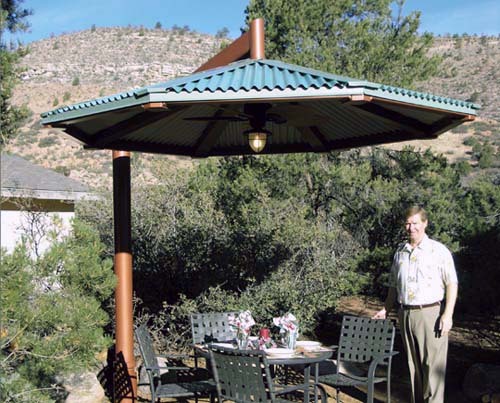 Newell teamed with Jack Cahill his partner, who was raised in the steel manufacturing business, and had the same dream of creating the finest quality, long lasting, shade structures with new and innovative designs and connections. That partnership created Classic Recreation and for the past 16 years the company has been the industry leader in design, fabrication, and innovative connections. We were the first to design hidden connections where you can not see bolts, now all of our competitors are following our lead not only in fabrication and erection but also in design. The main goal for both Newell and Jack was not to be the biggest in the industry but to be the best. When looking for a prefabricated steel shade shelter, pavilion, gazebo and kiosk here are 6 points to consider. Design: Is the design aesthetically pleasing ? Is it to scale or proportional ? Do the columns, eave height, roof pitch give the structure a pleasing look? Installation: Is the structure easy to install? Are the install instructions easy to understand ? Are the frame and roof members easily identified and the connections easily accessible ? Are the roof sections cut precisely and do they install quickly? All trim pieces properly packed and protected and easy to attach? Durability: Is the structure engineered for the loading and wind conditions for the area in which it is to be installed, the Classic standard is 30 pound live load and 100 mile per hour wind. However in Florida where we engineer for 150 mph wind, we have never lost a shelter through all the hurricanes. Vandal resistance: Classic Recreation can coat frame members with anti graffiti coating to prevent “Taggers” from ruining the frame finish. All steel structures are fire resistant and have hidden connections so vandals can’t disassemble the structure. Source of Revenue: Many times parks will rent out their structures for weddings, corporate picnics etc. providing a revenue stream. Whether your requirement is a Park Shelter, Kiosk, Bus Stop, Entryway, Dugout or Trellis, and your client is a School, Park, Ball Field, Church, Military Base or Municipality, Classic Recreation has, and continues to be the leader in pre fabricated steel structures, recognized world wide. Thank you for your interest in bus stops, kiosks and pavilions and the information about Classic Recreation Systems.